In November our hearts and minds turn to pies. Pumpkin pies, in fact. 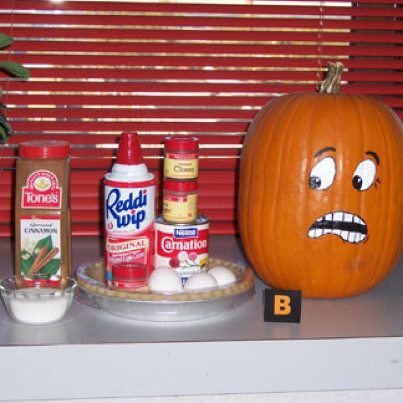 I used to have to bake a round dozen of pies during November. (and repeat, but with less pies in December) But nowadays, being retired and a widow, there are less pies necessary. What did I used to have to bake? Two pies for my husband to take to work for their early Thanksgiving party. Two pies for my husband's birthday on November 15 - because he hates cake. Two pies for November story time at my library for my Pumpkin Pie, Oh My! storytime. And two more pies because my granddaughter's birthday is at the beginning of December. It got so I stopped making homemade crust and bought ready made ones at the grocery store. Actually, this is not my recipe. I don't use the condensed milk one. I use an old Fanny Farmer cookbook recipe with real milk and four eggs. The whipped cream is vital for serving, but for family I usually whip the heavy cream, adding vanilla and sugar. I just thought the expression on the pumpkin was funny. This year I'm only making four pies in November. And two this week for Thanksgiving. And the Doctor has the last word. 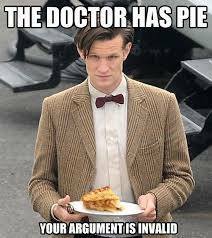 There is no argument against pie. November is pie month.